Today I have the pleasure of taking a look at a small piece of the gematria within the Book of the Law. Written in 1904, Crowley – who had made a keen study of the Merkabah and the Torah – encoded a Hebrew/English transliterated form of gematria within the pages of the dual monikered ‘Liber Al vel Legis’. The story behind Crowley’s relationship with the Merkabah is for another day. Today I just want to share the results of my studies regarding the AL III,7 : “I will give you a war-engine,” as the phrase is particularly enigmatic. Also I believe that allowing you to read my notes will give you insight into how to go about the art of gematria properly. I have a number of tools open on my desktop; Shematria, this word pad, and an ordinary calculator. 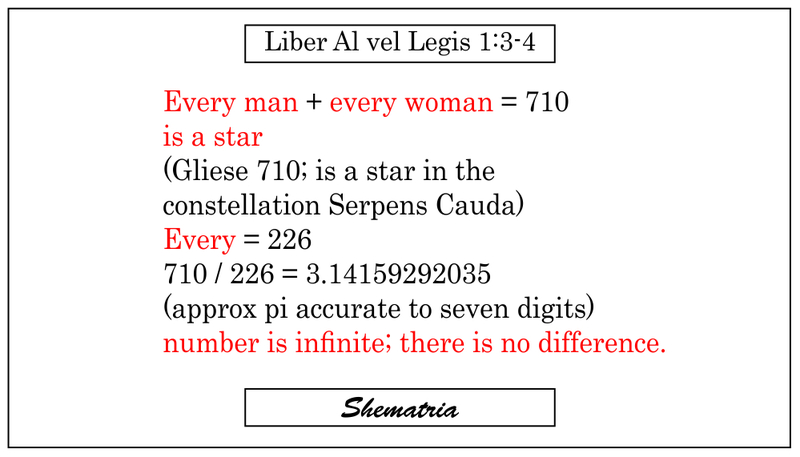 I want to start by seeing line 7 in context of the gematria around it, since the math is probably part of a series. Line 1: Abrahadabra = 418. [abrahadabra + reward + ra + hoor +khut = 1420 (710 x 2. See AL 1.3-4 also). Spelling is defunct; all is not aught”. 818 – (minus because it is from) Ra Hoor Khuit! 596 = 222. Therefore, to cure the division in the hearts of men (which is 555) we add 222 and receive 777. Line 8: “With it ye shall smite the peoples; and none shall stand before you”. Peoples = 330. Peoples – War Engine = 0 and thus the peoples have been metaphorically ‘smited’ with gematria. Line 9: Law of the Battle of Conquest = 710. As a student of gematria it’s made me wonder whether Crowley was alluding to biblical battles as being similar plays of mathematics. The first time the word for war is mentioned in the bible is Genesis 14:2 if you fancy following that up, but for me that’s it for today. Have a great day and stay tuned for more numerical honey. א Aleph A = 1, ב Beth B = 2, ג Gimel G = 3, ש Shin Sh = 3, ד Daleth D = 4, ת Tav Th = 4, ה Heh H,E = 5, ו Vav U,V,W = 6, ז Zayin Z = 7, ח Cheth Ch,C = 8, ט Teth T = 9, י Yod I,J,Y = 10, כ,ך Kaph K = 20, ל Lamed L = 30, מ,ם Mem M = 40, נ,ן Nun N = 50, ס Samekh S,X = 60, ע Ayin O = 70, פ,ף Peh Ph,P = 80, צ,ץ Tsade Ts = 90, ק Qoph Q = 100, ר Resh R = 200.